​​​ U.S. – Demand for efficient logistics space that facilitates quick movement of goods to consumers has caused warehouses to increase in size and height. 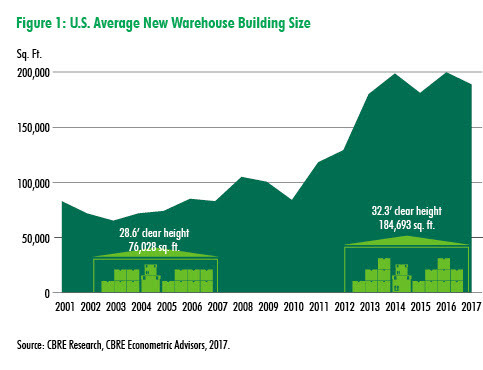 The average new warehouse completed in the U.S. between 2012 and 2017 increased by 108,665 sf (143 percent) and 3.7 feet in ​height since the last development peak between 2002 and 2007. Distribution markets that serve major population regions and have land for new warehouses saw building sizes increase the most, including Atlanta, the Inland Empire and Cincinnati. Rapidly growing e-commerce sales are the primary driver of this trend, and markets lacking sufficient modern logistics facilities have further expansion potential ahead to keep pace with this rising demand.